Suppli come from Rome and the Lazio region. These delicious Breaded Risotto Balls are known as Arancini throughout many other parts of Italy and are originally from Sicily. One of the main differences between Supplì and Arancini is that Supplì tend to have cheese in the centre. The very traditional Roman Supplì are made with a meat & tomato risotto and have mozzarella in the centre. Suppli are exquisite Italian morsels. You can eat them as starters (that’s their original place in a meal) or as finger-food at a buffet, as a main meal with a salad, or as a perfect TV dinner, to name but a few ways to enjoy these versatile little risotto balls! Supplì are usually served in traditional “Pizzerie” (Pizza Restaurants) as ‘antipasti’ (starters). They can be made with almost any risotto base. The Roman/Lazio “Supplì al Telefono” (called that way because, when cut in half, the two halves are on a ‘telephone wire’ to each other via the stringy melted cheese) tend to be more oval-shaped, whereas “Arancini” can have round, oval or tear-drop shapes. I tend to make them all into small, round morsels as they are easier to shape and easier to eat as a snack or appetiser. They make fabulous party food! Supplì are not hugely difficult to make, though they do require patience as they take time. It may take a few attempts before you get them right, but it’s worth persevering. If you really don’t want to make them yourself, do make sure you try them if you go to Rome. Or ask for Arancini in other parts of southern Italy, especially Naples and Sicily. The recipe below is for small, round vegetarian – tomato and mozzarella – ones (traditional Roman ones are larger and oval, and are made with a minced meat and tomato risotto base – similar to a bolognese sauce in a risotto – rather than a simple tomato and onion risotto base). TIP: If you were making ordinary risotto, you would leave it quite ‘wet’, but for the Supplì you need to ensure you don’t have excess liquid. Also, bear in mind that the rice will become drier as it cools down and absorbs the last of the moisture. TIP: I like to use latex/vinyl gloves when rolling the Supplì – it stops my hands from turning orange and also allows the fat from the risotto to stay on the rice rather than absorb into my hands, which makes it easier to coat the rice balls in flour. I also like to have a bowl of lukewarm water and a towel handy so that I can wash excess breadcrumbs from my hands between batches. TIP: You can either repeat this process until all your rice balls are ready to fry or you can do them in batches of 3-4 and roll the next batch while you’re frying the previous one; the latter method is faster, but if you’re nervous about timings/burning the supplì, do the two steps separately. 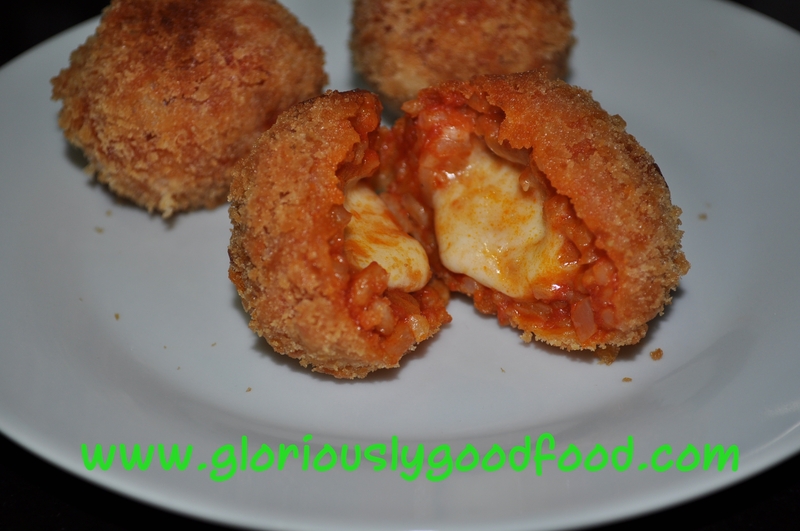 This entry was posted in General Thoughts & Ramblings, Italian, Pasta & Rice and tagged arancini, breaded risotto balls, onion, parmesan, rice, risotto, risotto balls, supplì, tomato, tomato and mozzarella arancini, tomato and mozzarella suppli. Bookmark the permalink.